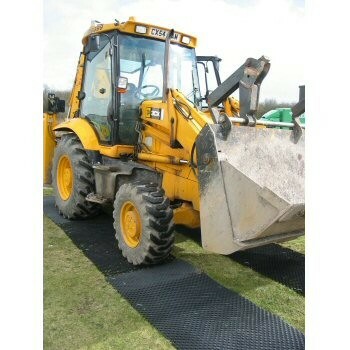 This is a quick and easy way to erect a temporary road or temporary access to your site. A few Track Guard panels and a few Fixing U Pins (sold separately) and you can have a temporary road or temporary access completed in minutes. 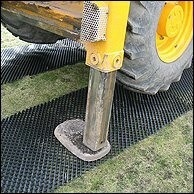 Manufactured from high density polyethylene, this thermoplastic extruded mesh panel is extra thick to support heavy weights and has a high profile providing extra grip for both wheeled and tracked vehicles. 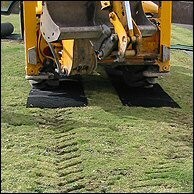 UV stabilised and unaffected by chemicals, Track Guard can be re-used many times over providing long lasting protection. Supplied in panels measuring 2.05m x 1.2m, Track Guard weighs less than 10kg yet each panel will support vehicles up to 20 tonnes. Simply laid down and joined with either fixing pins or cable ties, Track Guard can either be used for temporary protection or if left in position the grass will grow through the mesh providing a stable and green environment. Applications: Temporary access by construction plant over grass or asphalt, reinforcement of entrance to overflow car parks, temporary roadways, gateways, entrances to car parks, cable protection and movement of caravans.